Betty Dixon Obituary - Scranton, Pennsylvania | Solfanelli-Fiorillo Funeral Home Inc.
Betty Dixon, 90, of Scranton passed away Monday peacefully at home surrounded by her family. She was preceded in death by her loving husband of 65 years Harold Dixon Jr. in 2014. Born in Scranton in 1928, she was the daughter of the late Harold and Margaret Harris Mirtz. She was a member of the United Baptist Church, Scranton. Betty was a 1946 graduate of West Scranton High School and received her nursing degree from Moses Taylor School of Nursing in 1949. She was employed as a RN at Moses Taylor Hospital before leaving her career to devote her life to raising her family. She was a loving and devoted wife, mother, grandmother, great-grandmother, and friend. She gave unselflessly to all putting their happiness first. The center of her life was her family and she will always be remembered for the unconditional love and support she gave them. Affectionately known as “Nanny”, a name given to her by her first grandchild Lisa, her greatest joy was spending time with family. 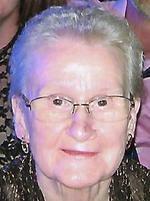 She enjoyed playing cards, watching GSN, New York Yankees and the Florida Gators. Over the years many holidays were celebrated at her home creating many memories that will last a lifetime. Her unconditional love will be remembered by all who had the pleasure of knowing her. The family would like to extend their gratitude to Dr. Kurt Moran and his office staff especially Amy. Also, Personal Home Health-Hospice nurses, Leslies and LuAnne for the care and compassion they provided. Surviving are two sons, Hal, and Rick and wife Barb; a daughter, Donna; seven grandchildren, Lisa Dixon, Brenda Dixon and husband Dennis, Kevin Dixon and wife Megan, Bryan Dixon and wife Meghan, Danielle Call and husband Ryan, Noelle Egan and Tony Potis, Jennifer Palazzari and husband A.J. ; eleven gret- grandchildren, Kyle, Olivia, Gavin; Sam and Emma Egan, Abbi and Brody Call, Dante, Lola, Natalia, and Salvatore Palazzari; several nieces, nephews, and cousins. She was preceded in death by her father in law, Harold Dixon Sr., and mother in law, Martha Lewis Dixon. The funeral will be conducted Friday at 11:00 a.m. in the Solfanelli-Fiorillo Funeral Home Inc., 1030 N. Main Ave. with the Reverend Earl O. Cassell, retired officiating. Interment will follow at Cathedral Cemetery. Family and friends may pay their respects Thursday from 4:00 to 7:00 p.m. at the funeral home. In lieu of flowers please send donations to National MS Society, Pennsylvania Keystone Chapter, 1501 Reedsdale St. Suite 105, Pittsburg, Pa. 15233, or St. Jude’s Children’s Hospital, 262 Danny Thomas Place Memphis TN 38105.